Thriller was a short-lived action/espionage series published by DC Comics in the early to mid 1980’s. DC only sold the book through the Direct Market at a time when comics were still available on newsstands and magazine shelves. 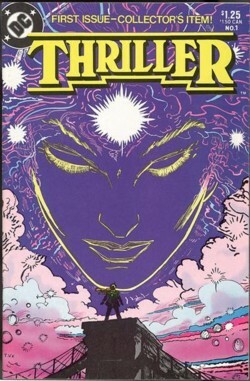 Thriller was created by writer Robert Loren Fleming (a collaborator with artist Keith Giffen on DC’s Ambush Bug) and artist Trevor Von Eeden (Black Lightning for DC and Power Man and Iron Fist for Marvel Comics), but neither creator was on the series during its final four issues, with Fleming leaving after #7 and Von Eeden after #8. The series focused on Angie Thriller and her operatives “the 7 seconds” a group that took on unusual missions. In Thriller #1 (cover dated November 1983), entitled “Down Time,” Angie Thriller (Angeline Marietta Salvotini-Thriller) and her husband Edward Thriller obtain their “7th second, a cameraman named Daniel Grove. Thriller, at least in this first issue, bears a passing resemblance to the pulp crime series, The Shadow, particularly in the manner in which Daniel Grove is recruited into the “7 seconds” team. Thriller may have been considered groundbreaking for its time, at least as far as comic book series published by DC Comics and Marvel Comics were concerned. Certainly, from a visual point a view, artist Trevor Von Eeden took a direction in creating his comic art that was different from superhero comics of the time. Von Eeden’s art emphasized mood and character psychology as much as it did linear storytelling. That is evident in the first issue, of which a synopsis follows. “Down Time” opens on a TV screen as SNN Nightly News gives an update on the crisis in Mecca, where it is “Day 4” in a terrorist takeover of the Holy Mosque by Molluskan terrorists. The scene bleeds from the network anchor over to Mecca where we find cameraman Daniel Grove in the thick of gunfire – ducking and dodging bullets with his twin brother, war correspondent, Ken. As luck would have it, the brothers encounter the leader of the Molluskan terrorist, a sinewy giant named Scabbard, who wears a red hood over his head. Scabbard instructs his “woman,” Malocchia, to use her hypnotic powers on Ken and Daniel, but Ken raises his pimp hand on Malocchia (slaps her). Enraged that another man would hit his woman, Scabbard, calling Ken “Satan,” delivers a brutal beating to Ken, all the while Ken insists that Dan film it using his “simuleye transcam,” a camera that films and directly transmits images to a communications satellite. Scabbard draws a sword from a scabbard-like pouch (of skin) attached to his back and beheads Ken. Next, Daniel is dumped out of the car and into an alley where he witnesses a beautiful young woman dressed in a flowing white, sheer satin costume dispatch her male attackers. She’s White Satin, the 2nd second. Next, he finds himself in the presence of Angie’s gun-toting brother, Tony Salvotini – Salvo – the 3rd second. Salvo knocks Daniel off the roof of a building where he falls into the weird presence of the 4th second, Beaker Parish. Parish takes Daniel by helicopter to a mysterious penthouse where he meets the 5th and 6th seconds, respectively Proxy and Crackerjack. As he is realizing that he may be the 7th second, Daniel meets Angie’s husband, Edward Thriller in person. While writer Robert Loren Fleming uses the dialogue to inform the reader of Thriller’s characters and near-future setting, Von Eeden decorates his panels in layers and sometimes full curtains of black ink. It’s a fluid, rhythmical application that encourages the reader to see the story as not only science fiction, but also as a noir-infused narrative. In the first issue, Von Eeden rarely breaks the page down into anything less than 9 panels. This accomplishes a few crucial things. First, using so many panels gives the static or still image of each individual panel the slight illusion of movement when combined with a sizeable number of other panels. Secondly, the rapid fire pace created by squeezing a lot of panels into the page space will allow the reader to feel a sense of disorientation similar to what the protagonist Daniel feels. Thirdly, the more panels Von Eeden draws on a page, the more information he can give a reader, which in a sense will encourage a reader to either pay attention or end up lost. Fleming and Von Eeden are introducing the reader to the world of Thriller through Daniel Grove’s eyes, and they want the reader to feel this new world the way Daniel does. The particular structure of Thriller’s storytelling, particularly Von Eeden’s art, is meant to make that happen.